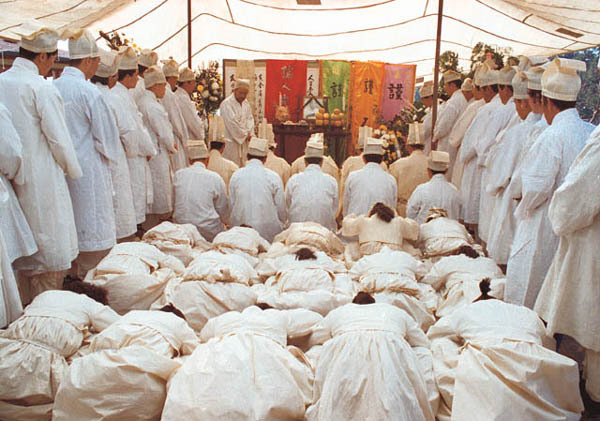 Festival (1996) and the Acceptance of Loss – Im Kwon-Taek. Celebrating loss can be a difficult task even for the more optimistic of personas. The idea of someone being physically and emotionally lost is not a pleasant experience which, at best can provide some cathartic character building in between the tears and complete incomprehension as to what exactly it means to live or die. It’s a theme familiar in many filmmaker’s auteur driven, thematic catalogues, perhaps governed overall by Ozu Yasujirō who is the undisputed master of equating the passing of time to the death of relationships and the death of parental figures (whether in actuality or simply emotionally). Another Asian director has sought to define this critical period of loss and has created an interesting comparison to the work of Ozu. South-Korean director Im Kwon-Taek has broached the issue in a number of films but never more so than in his 1996 film, Festival. From an ethnography point of view, the film is in itself fascinating, simply for its accurate relating of the Korean funeral arrangements rarely seen in more typically westernised South-Korean cinema. Festival revels in the finer details of the funeral rights and events that surround the death of an old grandmother. The film takes the time to actually explain each procedure from what happens to the body to the traditional names of the festival-like celebrations and marches. Im is however, not just bothering to recreate the cultural practices for their own sake. Though these aspects are interesting, a film simply focussing on them would soon lose visual interest relatively quickly. Instead Im can be tied to Ozu again in showing the multi-faceted, emotional stance of a whole family in mourning. There are numerous ties to Ozu’s Tokyo Story (1953), predominantly the showing of different responses to one’s parents once they are of a much older age. In Im’s case, the older generation has died but the different states of relation within the Hirayama family of Tokyo Story have strong parallels to the South-Korean family in Festival. Festival’s young son, whom the film initially puts the focus on (almost as a ploy to distract from the far more interesting relationship of the younger female outsider) is a successful writer who takes his personal biographer to the occasion. He seems the more optimistic of the characters though his initial journey to the funeral from his clearly affluent, modern household perhaps explains this. It is not unreasonable to equate him to one of the busy, uninterested siblings of Tokyo Story. More interesting is the story’s gradual focus on the estranged granddaughter who appears to be the relation who is feeling the loss of the older women more than the others. Her illegitimacy seems to have given her aunties reason to cast her out yet she is the person who seems most at loss. Constant flashbacks to a beautiful scenario full of falling, pink leaves from a tree seem to point to an idyllic past with genuine affection being shown to someone who was unfairly treated due to public face. While the outer family members and more vague relatives enjoy the chaos of the festival that is put on by the grandmother’s children, each sibling is given a chance for reflection, though few take the opportunity. One sibling in particular would not dare address her feelings towards her mother which would shine a harsh light on the irony of her over-the-top public display of grief. For a film about a funeral, grief is not as simplistic a word as in the Western dramatic sense. It takes on many forms, morphing its way through characters like ripples from a pebble of mortality in a lake of repressed feelings and desperation to keep public face. In the end, the story itself finds its way into the writer’s latest children’s book which somehow reflects the life of the estranged granddaughter. Her belief in a rebirth of the grandmother is reaffirmed by the image of the rose-petal tree which is shedding its leaves as the seasons change. Seasonal representation in South-Korean cinema is quite a popular topic if the national cinema that makes it into the West is anything to go by. Festival is not as overt as the likes of Spring, Summer Fall, Winter… And Spring (2003) and is only using the theme as a passing gesture but is still effective. The film is however still optimistic on the passing of life, something which Ozu, ever the pessimist, simply could not adhere to. This is where Im’s film comes into its own and the fleeting comparison to Tokyo Story becomes redundant. In Festival, Im shows the difference that time and distance can have on family relationships but by showing the seasonal rebirth as a reason for optimism (heightened further by the final family photograph which starts off in deadly seriousness but instead captures everyone laughing) he ultimately shows the acknowledgement of death to be both an inevitable hurdle and a source of emotional growth once jumped. You can watch Festival on the Korean Film Archive YouTube channel, here. Theorem – Pier Paolo Pasolini (BFI Release). South Korean Film Music and Ease of Distribution – Part 1 (Tradition vs. Globalisation).